Time. In most cases, you speed the learning process considerably. Funds. Save a considerable amount of money, by paying for less college credits or cheaper programs. Optimal learning experience. Some programs, such as apprenticeships, impart skills directly. Apply latest technologies. There is usually a lag between technologies employers use and those taught in college courses. Latitude to include personal and adaptive learning. There are still requirements, but students have more options. Though, micro-credentialism is not completely divergent from a college path. SUNY is already offering micro-credential programs. It is also not far from the rapidly growing Competency Based Learning (CBL) programs in higher education; according to a Techcrunch article, this year over 500 colleges and universities offer CBL programs (up from an estimated 52 last year). In some subjects, micro-credentialism might be simply removing the ‘general learning requirements’ that usually takes up about two years. I suggest the coding boot camps for head strong coders. Why not start a ‘hack a thon’ from day one? In my opinion, learning to code from an expert saves a tremendous amount of time trying to discover underlying methods on your own (and in a classroom). I am also a big advocate of self-guided learning. Once you have foundation thinking and problem solving skills, you should be able to acquire skills across disciplines and subjects. There are many careers where students can be put on a fast track. This includes careers in STEM fields and some careers where a bachelor’s degree has always been a requirement. Below, I provide an example of one of those careers: an accountant. I went to the website where you signup to take the CPA exam. There is a section laying out precisely what college courses a person needs to take the exam without getting a full bachelor’s degree. Then, I went to an online college and mapped out the courses. 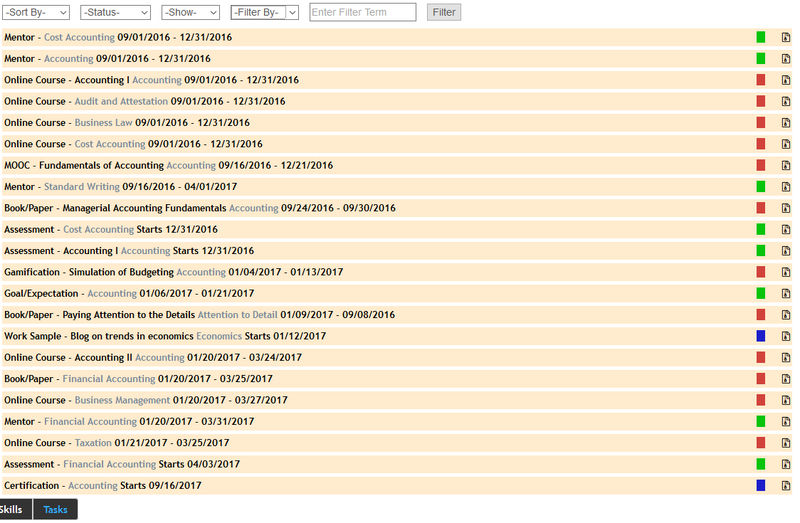 In the screenshot from the Skills Based Approach application (shown below), there is a list of all the required and recommended tasks I would do if I was a prospective CPA candidate. Three big advantages are: getting the education in less than a year, saving college expense on the magnitude of tens of thousands, and supplementing the learning process with self-guided resources and experiences. I would add three such resources. First, take a MOOC from a top university (on Coursera there is Intro to Accounting from Wharton); figure if I did well enough, I would contact the professor and ask for a recommendation. I would also try to make connections in the discussion forums. Second, I would look for a game / simulation of managing a budget and accounts. (In the sequence of tasks below, I planned this during winter break). Third, actively seek out mentors from the first to last course. Since it is an accelerated program, I cannot wait for the opportunity to happen. Skills-Based Approach is an ideal methodology and application to take a micro-credential path (as shown in this example). Actual Screenshot from Skills-Based Approach application.